Dating is hard enough without having to field negative comments about your appearance from online trolls. Sadly, that's exactly what one woman experienced earlier this week when a man criticized her gorgeous natural curls on a dating app. Her response to his unsolicited advice, however, was simply perfect. "Very attractive beautiful let ur hair grow long and straight no disrespect intended or trying to affend [sic] u im telling u from a guy perception." She promptly replied to the jerk with a classy, simple phrase: "I style my hair the way I want to." To air her frustration, Steinberg took to the R/CurlyHair forum on Reddit, as reported by Allure, and shared the insulting message, captioning her post: “Unsolicited advice. I've got naturally curly hair & this guy sends me this message. I just had to share. It bothers me to no end that people think curlies would look better with straight hair. Why should we change our God-given hair texture to look better for YOU? vent over." Steinberg told TODAY Style she posted the message on Reddit on a whim. "A lot of men have keyboard muscles when it comes to these online dating sites, so when I saw that message with the unsolicited advice on how I should wear my hair, I had to share it with the curly hair community," she said. 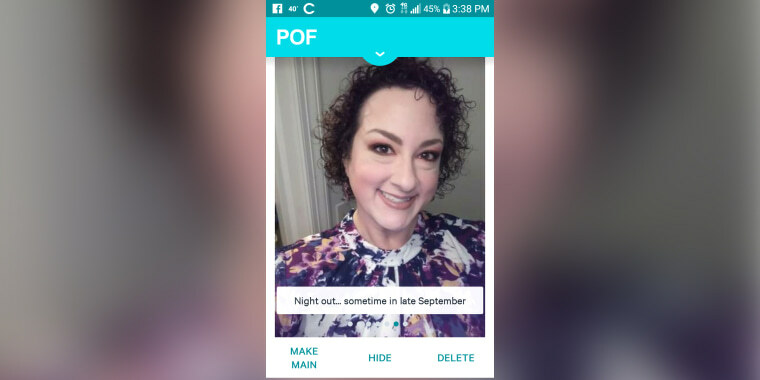 Although this is the first time she's received this type of comment on her hair, Steinberg said she's used to inappropriate messages on dating sites. "It's bad enough that I encounter negative comments about my weight on these dating sites, but now I have to worry about what a man thinks of my hair? I stopped caring what people thought of my appearance about 20 years ago; I don't plan on stopping now," she said. And this isn't the first time she's fought back at online trolls. She said that "99.9999 percent of the time" she responds to messages, even if it's just to say she's not interested. "Sometimes, though, the messages are just so appalling that I really want to ignore them. But in the case of the hair advice, I just had to respond," she said. Like many women, Steinberg said it took her a while to come to love her natural curls. Now that she's comfortable in her skin, she isn't about to let some random guy insult them. So far, the reaction from fellow Reddit users has been amazing, and Steinberg feels lucky to have their support. "The curly hair community is a wonderful, welcoming, open place. They all commiserated with my reaction to this mans 'advice.' I got to hear experiences from others. It was a great reaction, overall and I am glad that I shared," she said. As for the man that told Steinberg to straighten her hair? Well, he did reply to her empowering response and insisted he did not mean to offend her. He's since sent multiple apologies and told her he regrets his choice of words. "Honesty is always a wonderful thing. However, unless you are asked, do not offer advice regarding a woman's looks, weight, hair, makeup, taste in music, fashion, etc. If me speaking my mind and holding my own lessens my chance with men out there, then so be it. I am my own person, I LOVE who I am, and why should I let some jerk online make me feel otherwise?"